Alhambra, CA - His Grace Bishop Maxim of Western America celebrated his Krsna Slava, Lazarus Saturday, on Saturday, April 7, 2012. 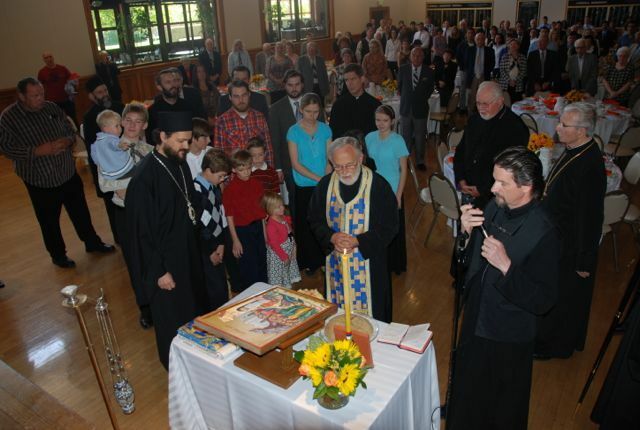 The bishop officiated at the morning's Holy Hierarchical Divine Liturgy. Besides the diocesan clergy and faithful joining their diocesan hierarch for his Slava, special guest was His Eminence Archbishop Joseph of the Antiochian Diocese of Los Angeles. A very joyous and Sretna Slava to His Grace. Eis polla eti despota!